How would the Russian Empire have reacted to the fall of the monarchy if Twitter existed 100 years ago? Imagine the social media storm that would have been triggered by the overthrow of the centuries-old tsarist rule with RT’s #1917LIVE project. The popularity of Tsar Nicholas II and his consort Tsarina Alexandra hit rock bottom by March 1917, as the country faced setbacks in the bloody and exhausting WWI, food shortages and growing social discontent. On March 15, the Emperor and Autocrat of All the Russias was forced to abdicate in favor of his brother, who in his turn refused the crown. And so the sun set on the glorious Russian Empire. And yet, despite tremendous disapproval ratings, the Romanovs received an outpouring of sympathy from many subjects still loyal to the old order. 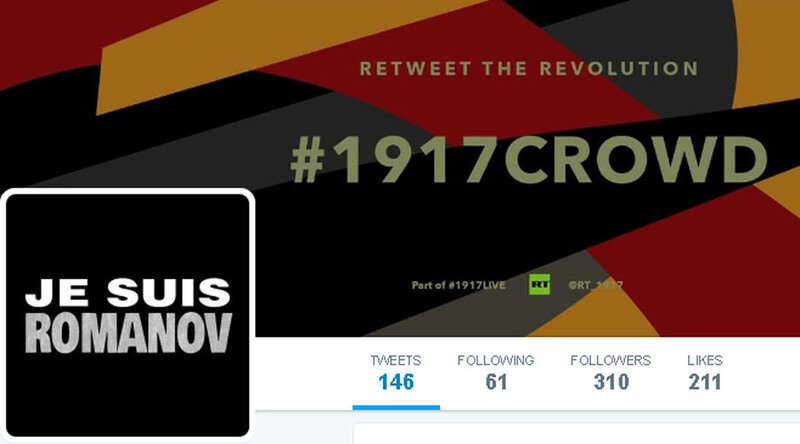 They launched #JeSuisRomanov hashtag to support their former sovereign. Princess Olga Paley, the wife of Grand Duke Paul Alexandrovich, an uncle of the tsar, takes to Twitter to vent her frustration after an arrest warrant was issued for the imperial family. — Princess Olga Paley (@OlgaPaley_1917) 17 марта 2017 г. — Princess Olga Paley (@OlgaPaley_1917) 16 марта 2017 г.
Baker Filippov, whose bakery was ransacked in the first days of the February Revolution has doubts that the tsar abdicated voluntarily. Does anybody really believe @NicholasII_1917 abdicated voluntarily? Fake news! — Filippov Bakery (@FilipBakery1917) 16 марта 2017 г. The vast majority of conservative and traditionalist peasants do not really feel the revolutionary drive and hold firm to the idea that the monarch is the nation’s father. Some big businesses that were dependent on the state, like the heavyweight Putilov plant, are worried about their future. But with Nicholas II having abdicated, revolutionaries are full of hope for a new, progressive and free Russia. Hashtag #NoMoreTsars is rampant. — Petrograd Soviet (@PetroSoviet1917) 17 марта 2017 г. — Ivan Chugurin (@IvanWorker_1917) 17 марта 2017 г. The young Russians are excited about the intoxicating spirit of the revolution. — Student Vladimir (@StudentVlad1917) 17 марта 2017 г.
Relive the fateful months of 1917 that forever changed the course of Russian history with RT’s #1917LIVE Twitter project. Follow Nicholas II, the empress, Lenin and other figures emblematic of that turbulent time. Readers have the opportunity to take active part in the events by creating historic Twitter profiles under the #1917CROWD concept and bringing history to life.